Our May 8th concert will be… killer! MCB will be joining forces with Pickering Community Concert Band to present the last show of our 2015/16 theatre series, but there’s a twist… it’s a murder mystery! 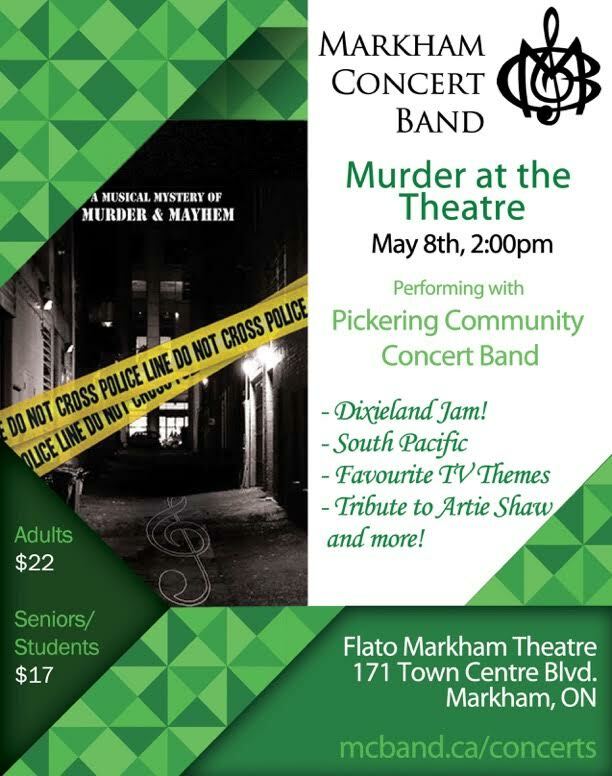 Join us at Flato Markham Theatre on May 8th to find out who is murdered and help us solve the case! Tickets are available at the Flato Markham Theatre website or by calling 905-305-7469. Don’t miss out on what promises to be a great and exciting afternoon! We were SNAP’D at our February show! Yesterday’s show “An Afternoon with Vern Kennedy” was photographed by SNAP Markham. Here’s one of their pictures – check out the rest on their site!